The OAN Nursery Guide is an indispensable resource. One of the many great things about living in the Pacific Northwest is the wide array of plants that grow here. Other parts of the country, by comparison, have a much smaller plant palette due to climate or water availability. In our stores, we love showing new residents to our area all the plants they have as landscape options. You really see the delight on their faces. The downside of this is that as a retailer, it’s hard to stock all of the plants that grow here! Every week our plant buyers get a list of plants requested by our customers and they go to work on finding them. Fortunately for us, there’s a resource at our fingertips that makes finding those plants easy! Some 43 years ago, the leaders of the OAN had the foresight to develop the OAN Directory and Buyers Guide — a 60-page publication that listed all the members of the organization. In the center of the catalog was a 12-page insert that listed various plants, products and services, and the companies that offer them. Since 1973, that small publication has developed and changed into something much bigger. It is now called the OAN Nursery Guide, and the company, plant, product and service listings now number in the hundreds of pages. This one resource has saved our company’s plant buyers countless hours over the years! Let me illustrate. As a child growing up, you test your parents’ boundaries to find out exactly what you can get away with. Looking back as an adult, you realize that’s an indicator of what they value the most. Well, I learned early on that my dad had one line you definitely could not cross: You could not take his office copy of the OAN Directory and Buyers Guide, or you would have to answer for it! To this day, my dad keeps his guide in his top desk drawer, with “JACK’S COPY” written in large letters on the cover in black marker ink. It is still his first and foremost resource to find what he’s looking for — and I know not to touch it, which is OK, because I like to use the online version. NurseryGuide.com has been online since the 1990s, but a dramatically improved version was launched in 2013. Since then, traffic has nearly doubled. For 2016, the site attracted 107,696 unique users and had 679,598 pageviews. The average user looked at about four pages and spent more than three minutes on the site. When you log on to the site, you see why so many nursery professionals turn to NurseryGuide.com. It is easy to use, whether you’re looking for a product, a company or a particular plant. Navigating the site is very intuitive. You can find everything from simple contact information to an updated detailed availability for a nursery. The site is offered in both desktop and mobile versions, so it’s easy to use in the office or out in the field. 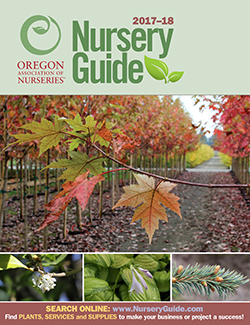 Today, Nursery Guide can be found in its original paperback form or online at www.NurseryGuide.com. With more than 800 companies listed — almost 500 of which are growers — you can find more than 21,500 plant, service and supply listings. It is the industry’s leading buyer’s guide. If you buy plants, I encourage you to check out Nursery Guide today and see how much time it can save you. And if you sell plants, I encourage you to list them on the site and in the book. With shipping season getting underway, now is the time. You can add them right now and they’ll stay online through March 2018. For the grower, Nursery Guide is economical and provides great return on the investment. As a buyer, I don’t know what we would do without it.